SIOUX FALLS, S.D. – A former bookkeeper at two Sioux Falls dental offices is accused of embezzling more than $100,000 in seven years. 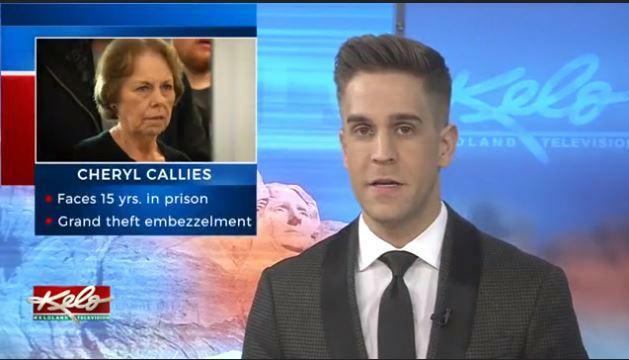 Cheryl Callies faces up to 15 years in prison, and two counts of grand theft embezzlement. She made her first appearance in Minnehaha County Court on Thursday. Court documents detail how authorities allegedly caught Callies, and a key reason may have been a change in ownership where she worked. Callies has worked for two dental offices in the same location. 10th Street Dental used to be Montoya Dental Office, before owner Thomas Montoya sold it in February. In June, Montoya reported Callies, his bookkeeper of 40 years, and accused her of embezzling more than $121,750. Court papers say a financial report found several payment discrepancies from 2011 to 2018. According to court papers, Callies’s legal troubles started a month before Montoya’s claims and with a much smaller amount of money. In May, a 10th Street Dental employee allegedly noticed a missing $100 cash payment for a dental exam. That employee discovered someone was manipulating cash and check payments. Callies is accused of embezzling more than $8,400 from 10th Street Dental. Callies allegedly admitted to adjusting payment records at both businesses. She allegedly told investigators she would accept cash payments, change the entry in the software system, remove the money from the nightly deposits, and later adjust the daily financial report so it matched payments and receipts. According to investigators, the deleted transaction records show an employee login initials for each transaction. The initials “CC” were listed in the “deleted by” column for these alleged manipulated transactions. In the court papers, Callies allegedly told investigators she was stealing money for video lottery, and because of “payday loans and loneliness.” She also claims she and Dr. Montoya had an understanding she wouldn’t have to charge her family for dental visits.